6 - Measure 2.75" x 1.75"
Our adorable Sweetheart Crispy Rice Bars are a perfect treat or gift for Valentine's Day! Sweet crispy rice and marshmallow drenched in chocolate bliss. Our Bear Hugs & Sweethearts Crispy Rice Bars are a perfect treat for Valentine's Day! 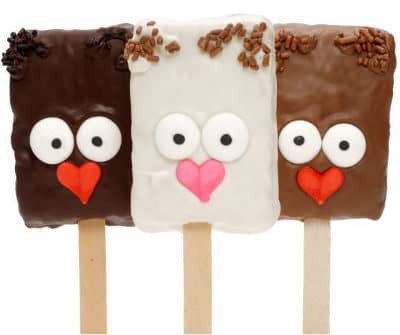 Hand-dipped in Gourmet Chocolate Confections - Classic Vanilla, Deep Chocolate and Milk Chocolate - our Crispy Rice Bars are hand-decorated to look like adorable Teddy Bears! Individually wrapped in cellophane bags, tied with festive ribbon and Gift Boxed, they're a sweet set to send to all ages! Shelf life 4-6 months. Ideal room temperature 65-72. Keep out of direct sunlight. Keep in airtight container.